If you are using Campfire all day long, you can use this integration to notify you of new tickets, comments and replies in a room of your choice. The integration let's you selectively enable/disable notifications. This is your campfire subdomain. If your account URL is company.campfirenow.com, the subdomain is company. You can get an API token by logging into Campfire and visiting 'My Info'. Before you save the integration, you can also select the kind of messages that you want to send to campfire. For example, you can choose to send only tickets and replies or only comments depending on your workflow. Once you have setup the integration, you don't need to do anything manually. 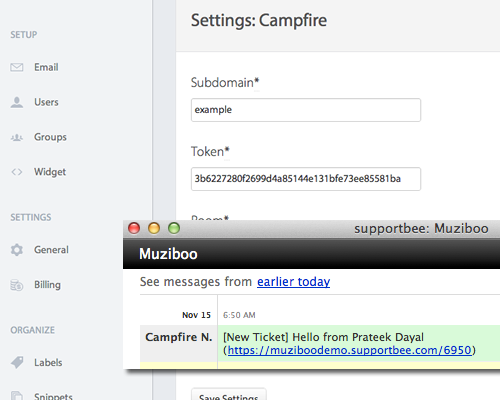 As new tickets, replies and comments come in, the integration will automatically post them to campfire.